If you like puzzles and ping pong, then Pleasantville, NY, was the place to be on December 17. More than 200 Kenthusiasts — people who love KenKen puzzles — descended on Will Shortz’s Westchester Table Tennis Center for the 2017 KenKen International Championship (or the KKIC, for short). 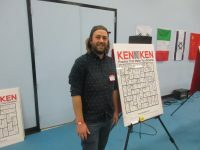 Participants followed 1.5 hours of solving KenKen puzzles with a pizza party and several hours of table tennis. The competition consisted of three rounds, with the three puzzles in each round slightly larger and more difficult than those from the previous round. Consequently, competitors were given 15, 18, and 20 minutes to complete the puzzles in the first, second, and third rounds, respectively. The leader after the written portion was John Gilling, a data scientist from Brooklyn, whose total score was 10,195. And if you’ve been paying attention, then you know what that means — Gilling earned 9,000 points for completing all of the puzzles correctly, so his time bonus was 1,195 points… which is the amount you’d earn for turning in the puzzles 2,390 seconds (combined) before time was called. The implication? Gilling solved all 9 puzzles from the written rounds — which contained a mix of puzzles from size 5 × 5 to 8 × 8 — in just over 13 minutes. As a result, Gilling, the defending champion, earned a spot in the Championship Round against Tess Mandell, a math teacher from Boston; Ellie Grueskin, a high school senior at The Hackley School; and Michael Holman, a technology consultant. In the final round, each of them attempted a challenging 9 × 9 puzzle, which was displayed on an easel for the crowd to see. Solving a challenging 9 × 9 is tough enough; having to do it as 200 kenthusiasts follow your every move is even tougher. When the dust settled, Gilling had successfully defended his title. For his efforts, he received a check for $500. But more importantly, he retained bragging rights for one more year. 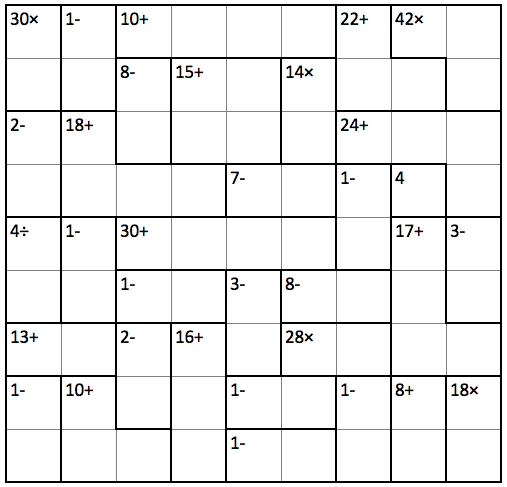 If you think you’ve got what it takes to compete with the best KenKen solvers, try your hand at the 9 × 9 puzzle that was used in the final round. In the video above, you saw how fast Gilling solved it to win the gold. But even the slowest of the four final-round participants finished in under 15 minutes. Finally, I’d be failing as a father if I didn’t mention that my sons Alex and Eli competed in the Delta (age 10 and under) division. Though bested by Aritro Chatterjee, a brilliant young man who earned a trip to the 2017 KKIC by winning the UAE KenKen Championship, Eli took the silver, and Alex brought home the bronze. They’re shown in the photos below with Bob Fuhrer, the president of Nextoy, LLC, the KenKen company and host of the KKIC. For more KenKen puzzles, check out www.kenken.com, or see my series of posts, A Week of KenKen. Is Your Gödel Too Tight? I don’t care what Stevie Nicks says, thunder does not only happen when it’s raining. And sorry, Kelly Clarkson, I’m not standing at your door because I’m sorry. Logical fallacies are rampant in song lyrics. (Don’t even get me started.) I’m therefore hopeful that you won’t attempt to channel your inner songwriter while trying to solve the following logic puzzles, arranged roughly in order of difficulty. Jack is looking at Anne, and Anne is looking at George. Jack is married, George is not. Is a married person looking at an unmarried person? Why was the third one able to respond in the affirmative? What is the five-digit number? Finally, she told me that the oldest one has red hair, and I finally realized their ages. How old are my friend’s children? If you take a positive integer, multiply its digits to obtain a second number, multiply all of the digits of the second number to obtain a third number, and so on, the persistence of a number is the number of steps required to reduce it to a single-digit number by repeating this process. For example, 77 has a persistence of four because it requires four steps to reduce it to a single digit: 77-49-36-18-8. The smallest number of persistence one is 10, the smallest of persistence two is 25, the smallest of persistence three is 39, and the smaller of persistence four is 77. Three gods A, B, and C are called, in no particular order, True, False, and Random. True always speaks truly, False always speaks falsely, but whether Random speaks truly or falsely is a completely random matter. Your task is to determine the identities of A, B, and C by asking three yes-no questions; each question must be put to exactly one god. The gods understand English, but will answer all questions in their own language, in which the words for yes and no are da and ja, in some order. You do not know which word means which. I asked my friend what he knew. Who are you, the Barber of Seville? You know at least one thing, namely that you don’t know anything. A contradiction! Ha! If you don’t (-) know nothing (-), then you must know something (+). A double negative. It was at that point that my friend stopped being my friend. This is what logic will do to your social life. Logic: a systematic method for getting the wrong conclusion, with confidence. But it can also be useful for solving problems. John had 50 candy bars, and he ate 45 of them. Now what does he have? And we end this silliness with three pieces of advice from the king of bad logic, Yogi Berra. Hope you enjoyed or did not enjoy this post (but not both). Don’t break a person’s heart; they only have one. Break their bones; they have 206.
Who can argue with that logic? Here are some other logical statements with which you won’t want to argue, either. I asked my wife what she wanted for her birthday. She said, “Nothing would make me happier than diamond earrings.” So, I got her nothing. It doesn’t matter if the glass is half empty or half full; either way, there is room for more alcohol. I only drink twice a year: when it’s my birthday, and when it’s not. My math teacher just fell in a wishing well. Go figure! I never knew they worked. My advisor says I’ll never graduate because I’m lazy. But I just can’t take that kind of criticism. I was going to kill myself… but the gun’s, like, way over there. Don’t judge a book by its cover… my math book has a picture of someone enjoying himself. Boy: I hate my math professor. He’s a terrible lecturer, he has bad breath, and he laughs at his own jokes. Girl: I’m Dr. Jacoby’s daughter. When you pay too much for cable, you throw things. When you throw things, people think you have anger issues. When people think you have anger issues, your schedule clears up. When your schedule clears up, you grow a scraggly beard. When you grow a scraggly beard, you start taking in stray animals. And when you start taking in stray animals, you can’t stop taking in stray animals. Stop taking in stray animals… get rid of cable. This extended chain of conditional statements forms an invalid argument. I mean, not that I really expected a bunch of ad execs to understand the rules of logic, but this is a rather basic fallacy. It’s a covert denying the antecedent argument, where the denial (-a) happens seven steps after the initial premise (a → b). The following is a similarly flawed argument, but the error may be more obvious due to proximity. If you like math jokes, then you are a dork. You do not like math jokes. Therefore, you are not a dork. If you don’t like math jokes, believe this argument is valid, and think you’re not a dork, look no further than the “I ♥ Anekin Skywalker” bumper sticker on your 1988 Yugo GV. Speaking of bad logic, how’s this? Therefore, all men are mortal. Therefore, Ray Charles is God. Here are a few other syllogisms that are a little more mathematical, though equally silly. Ten percent of all car thieves are left-handed. If your car is stolen, there’s a 10% chance it was taken by a polar bear. Thirty-nine percent of unemployed men wear glasses. Eighty percent of employed men wear spectacles. Therefore, work causes bad vision. Every second, 4,000 cans are opened around the world. Every second, ten babies are conceived around the world. That’s not true. And I can prove it’s not true, by showing that its contrapositive is untrue. P = You get math jokes. Q = You have friends. I have friends. Or, I have at least one friend, which is all I need to prove the truth of Q. And given that I’m the author of this blog, then clearly I get math jokes. Consequently, the contrapositive is untrue; and by the Law of Contrapositives, then the original statement is untrue. Q.E.D. A logician said to his son, “If you don’t eat your vegetables, you can’t have any ice cream.” Upon hearing this, the son choked down a plate of broccoli, and his father, duly impressed, sent him to bed without any ice cream. I then had to explain that the humor derives from the logical error known as denying the antecedent. The logician said, “If you don’t eat your vegetables, then you can’t have any ice cream.” It is a common mistake for folks to assume that the logician’s statement is equivalent to, “If you eat your vegetables, then you can have ice cream.” But it’s not. The second statement is the inverse of the original statement, and a statement and its inverse are not logically equivalent. The logician asserted that if the son didn’t eat the vegetables, then he would not get ice cream; however, he did not guarantee that his son would get ice cream for eating his vegetables. Yeah, you’re right. Even if you understand it, it’s still not very funny.